I have a small print with which I'm having some problems with the build plate adhesion. 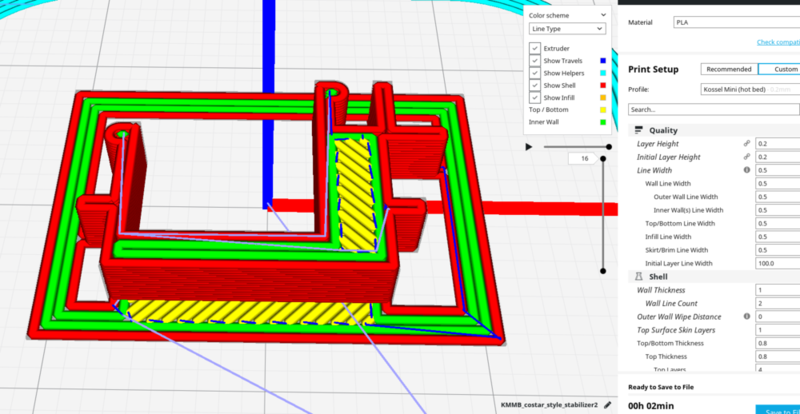 I don't however want to use the standard Cura brim because I'm printing many of this part and I'm too lazy to deal with the post processing. There's only a specific part of the print which tends to come loose so I thought I would add my own brim which only touches on the outer edges of my print. It basically a hollow square where the hollow is a bounding square of my print. 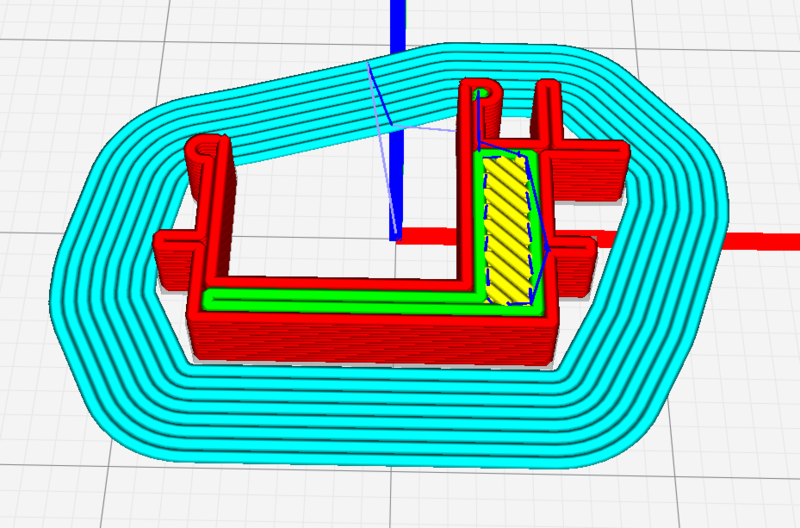 Cura, however completely ignores the brim, even though it shows up in the UI. I've tried making the 0.1mm and 0.2mm thick in the model but no luck. What am I doing wrong? However, I wouldn't do this myself as I think it will make a really bad mess to the edge of the part trying to remove that brim. Here's an example and it doesn't even use a very small gap and it is effective at stopping the corners of the part lifting due to them cooling. Can you post the STL without the brim? EDIT: don't bother, I'll just sink it into the buildplate! At least on the initial layer, Cura will completely ignore model portions that are too thin relative to the layer height. When I loaded up Cura with this model, my Initial Layer Height happened to be set to 0.27mm, and the brim was skipped by the slicer. When I lowered Initial Layer Height to 0.2mm, the brim was sliced as expected. So try either slightly increasing your brim's height in the model or slightly lowering your Initial Layer Height. That sounds like a neat idea. I'll try it out! I'm attaching the stl without a brim. Ack! it doesn't work because the skirt hugs the part's hull not the outline! What you could do would be to print your own brim that gets close to the part's outline. Hm, I'm not sure I follow what you mean. What is the problem? The end result in your image would in practice be more or less the same as in my initial stl right? I tried it out and it worked perfectly for my purposes. I'll probably be using this from now on, thanks a lot! Yeah, you're right, the end result is very similar to what you started with. Glad it's working. I guess that might make sense indeed? A theory is as good as it produces results. I found that the cooling fans do reduce bed temp by 10 to 15°C in the area where they are blowing; measured with an IR-thermometer gun. So maybe such a brim or wide skirt prevents the glass from cooling down too much and thus improves bonding? And/or maybe it deflects a little bit of the airflow away from the bottom layer? So that the first layer is sitting in the shadow of the wind? Anyway, I am gonna keep this theory in mind and try it on some of my next models with lots of tiny holes and sharp corners.